While Los Angeles County continues to benefit from a healthy economy and a strong tax base, I am pleased that the Chief Administrative Officer’s proposed 2007-2008 budget focuses on limited new spending and keeps our budget from growing beyond our means. This budget proposal shows that the focus of the County’s new spending is right where it should be, on programs and services that directly benefit local residents. Over three-fourths of the proposed new spending is going directly to increases in public safety and quality of life services, including over 100 new Sheriff’s deputies to serve our unincorporated communities. I am still concerned about the Department Health Services, where the structural deficit is quickly reaching a day of reckoning. The health department is anticipating a shortfall of at least $80 million in this coming fiscal year, which must be addressed before we close the books on the year. The costs to maintain the department are massive and we need to eliminate these shortfalls before the County’s General Fund and available funding for other critical services are impacted. Finally, I am very glad to see that my calls last year for the refurbishment of the Sybil Brand Institute for Women are being answered in this next budget year. The $245 million proposed for the refurbishment of Sybil Brand and the construction of new female barracks at Pitchess Detention Center is a critical step in ending the Early Release Program for the inmates in our jail system. Seeking to crackdown on hundreds of the County’s most heinous child support payment evaders, Supervisor Don Knabe today introduced a motion designed to create a partnership between the Los Angeles County Child Support Services Department (CSSD) and the Office of the District Attorney. The primary goal of this program would be to increase enforcement against parents who are the most delinquent in their child support payments. CSSD goes to great lengths to pursue collection of child support payments on behalf of families in need, and always seeks to establish cooperative relationships with the parent required to make payments. Unfortunately, there are hundreds of parents currently in the County’s system that go to great lengths to evade their child support obligations, even after arrest warrants have been issued. There are approximately 2,000 parents who fall into this category, and they owe over $2.5 million in child support payments. Currently, CSSD does not have the means by which to proactively serve these warrants. One possible solution to this problem is a partnership with the District Attorney, which would utilize retired District Attorney Investigators to pursue these 2,000 parents. Far too many families are struggling to pay their bills because this specific group of parents are choosing to evade or ignore their responsibilities, said Supervisor Knabe. Our goal here is to create a program that tracks down these uncooperative parents and forces them to pay their child support obligations. The marijuana dispensary currently operating in Hacienda Heights will be closing soon, Supervisor Don Knabe announced today. The dispensary, which is located at 15838 Haliburton Road in Hacienda Heights opened in May 2005 and was the first medical marijuana dispensary in the unincorporated area of Los Angeles County. At that time, there were no regulations in the County that governed marijuana dispensaries. Supervisor Knabe led the effort to make sure that these dispensaries would be adequately regulated in order to keep neighborhoods safe, and on May 9, 2006, the Board of Supervisors approved an ordinance that regulated marijuana dispensaries in the County. The new ordinance had a clause which stated that a marijuana dispensary must be at least 1,000 feet from a sensitive location like a school, church, library, etc. Under the new regulations the dispensary in Hacienda Heights was out of compliance with that clause. The operator of the dispensary, California Medical Caregivers Association, has settled with the County and agreed to cease all operations in the unincorporated area of the County for which they have not obtained permits or licenses required under the new regulation and will vacate the Hacienda Heights location on or before April 30, 2007. This is a big victory for us, said Supervisor Knabe. As I have said before this issue is not about whether medical marijuana is right or wrong – the voters have already answered that question. What is most critical is ensuring the safety of our children and our neighborhoods. Closing this dispensary ensures we are keeping our neighborhoods safe. 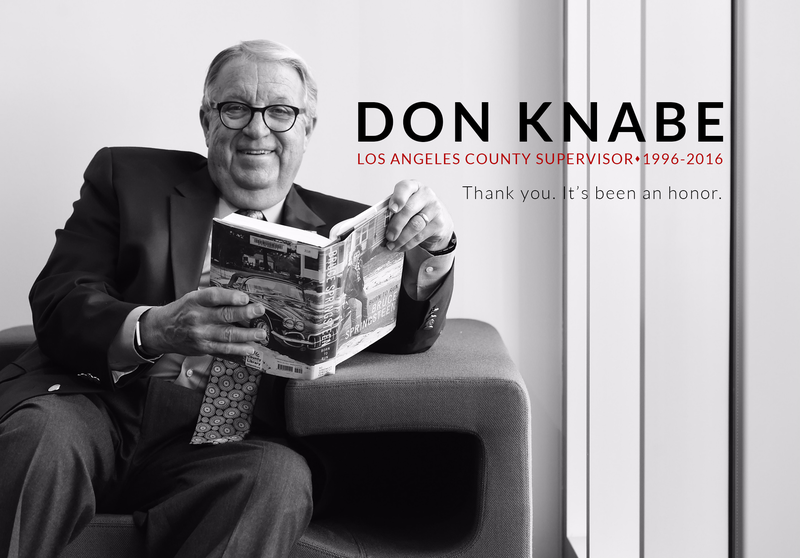 Los Angeles County Supervisor Don Knabe has been appointed to serve on the California Emergency Council. The appointment was announced by Governor Schwarzenegger on May 5, 2006. The California Emergency Council is the official advisory body to the Governor during an emergency and on issues of emergency preparedness. Additionally, the Council may advise the Governor on the State Emergency Plan and on the approval of orders and regulations. I am honored to have been appointed by the Governor, said Supervisor Knabe. I am looking forward to the opportunity to advise the Governor on the important issues this Council will take up. The California Emergency Council has a total of 10 members. Members do not receive a salary and the position does not require confirmation by the State Senate.